I arrived at the Millennium Trust at 9:00am and was shown around the offices by Shona. She explained to me what each part of the organisation did and how it worked. Everyone was very welcoming and I was able to get a real feel for how the organisation worked. Later me, and three others from YDMT, went to a Radio Training day in Settle- I wasn’t quite sure what to expect! We were in a side room at the Royal Oak in Settle, and Simon Rogers was there to tell us about Dales Radio (for which he is a presenter) and to demonstrate some basics in interviewing, recording and editing. After listening to some tips on interviewing, we came up with a question in smaller groups and then went out in to Settle to record our vox-pops (opinions as represented through comments from the public which are often broadcast). It was a fun way of utilising the skills that we had learnt in the morning and interesting to hear different opinions on the issues that we had chosen. In the afternoon, we began to experiment with the editing software (with varying degrees of success!) It was a complex skill that took a lot of attention to detail and precision, but after playing around for a while, it was satisfying to see our editing beginning to work. It’s certainly a skill that requires some practice though! By the end of the day we had all had a go at editing and I’d had a fun and absorbing day learning about Dales Radio. At the end of the day Judy and I drove back to Clapham to pick up some outdoor wear for the following day. I arrived at YDMT for Sarah to tell me about the online element of the organisation. She showed me the blog, the website and the social media, then demonstrated how lots of these elements were created. It was really interesting to see the work that went in to this side of the organisation and meant that I learnt a lot about the methods involved in maintaining a successful internet presence for an organisation. Then Judy and I set off to meet a group of refugees in Horton. 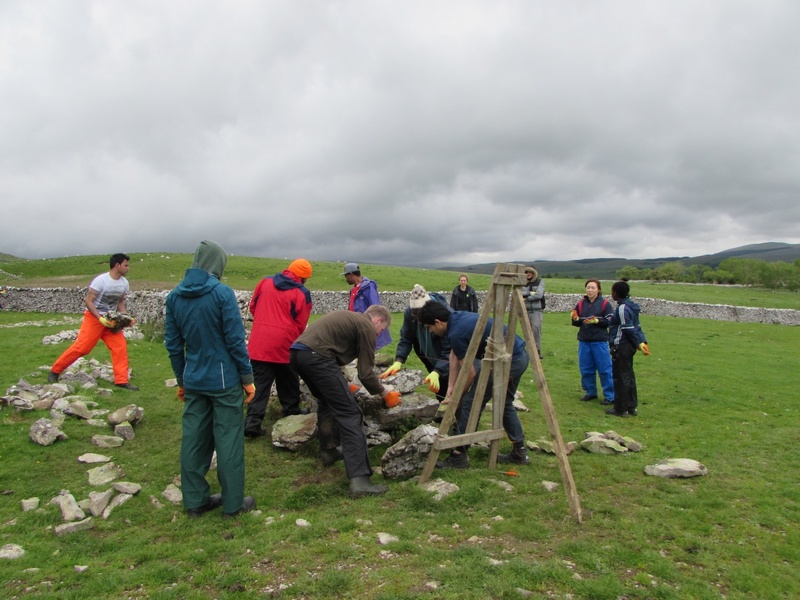 Our activity for the day was dry-stone walling, near Selside. On arrival, we got some food and drink ready in preparation for the arrival of the Refugee group that was coming from Blackburn. Once they had arrived and been kitted out with various items of outdoor wear, we all congregated inside to introduce ourselves and for each of the group to tell us where they were originally from. It was a diverse group with people from Iraq, Syria, Germany, Nigeria and South Korea. After this, we went out in to the cold wind to meet Colin who would demonstrate to us how the dry-stone walling was done. 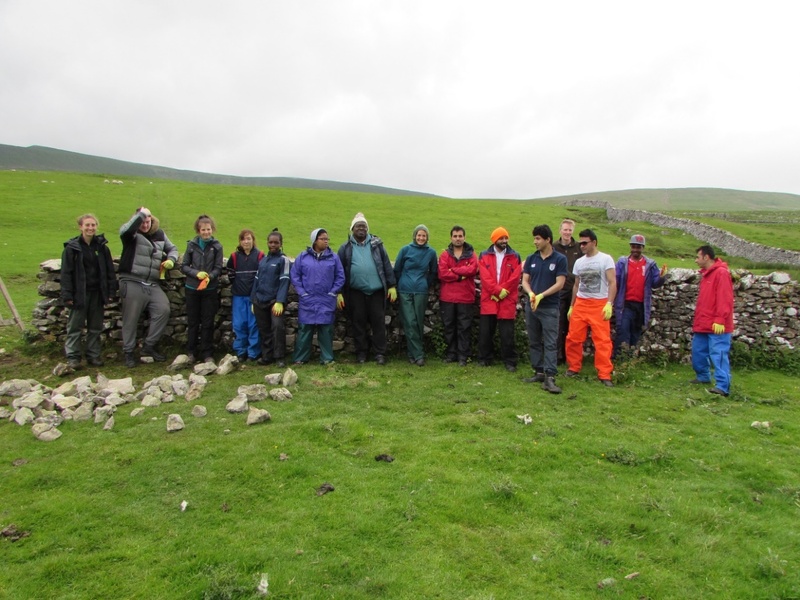 Lots of the group were raring to go and were soon at work collecting rocks to place on the crumbled section of wall. People in the group seemed to relish in the hard work, as many of them are unable to work because of their status as asylum seekers rather than refugees. In the morning, I was also persuaded to my try my new interviewing skills and interviewed John, who works with refugees and asylum seekers and had brought the group over to us that morning. After a morning of hard work, we went in the warmth for lunch, where we learnt about the groups’ professions. One worked in I.T., another had been a policeman, one had been a fisherman. Again, it was great to see the diversity of the group and learn a little more about their lives. In the afternoon, we set to work again, making quick progress on the wall (with lots of input from Colin), one man powering through the afternoon despite being on Ramadan! It was such a lovely way of working hard together and learning more about each other as the day went on. At the end of the day, John had the idea to get the group together and ask each person how the day had been and how they feeling. It was so lovely to hear how happy everyone was and how nice the day had been for them. Learning about some of those people and the countries that they came from was really lovely- it was a great day! On Wednesday I met Judy in Malham, where we were going to meet a Roma group of women and children. 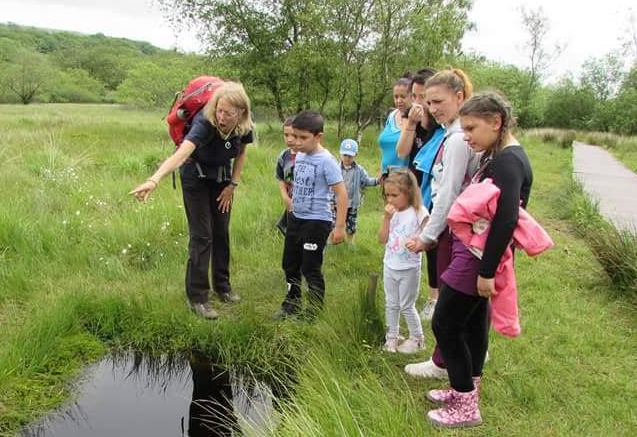 Firstly, we had to go up to the Tarn Centre to set up some activities- it was a sunny day so there would be lots of opportunities to be outside enjoying the beautiful scenery around Malham Tarn. We met the group at around 11:30 and drove straight up to Malham to begin our adventure. We started with the boardwalk, where Judy helped the group to spot flowers and animals and to identify them. The children were so engaged in what Judy had to say and soon became experts at spotting the animals or flowers that had been mentioned. We carried on walking up to the Field Centre, pausing to have a look in the bird hide and then again to have lunch near the Tarn. After lunch we walked up to the Field Centre in to the woodland where we had set a bug activity for the children to do. They had to walk along a string in the woodland spotting as many of the hidden bugs as possible, again everyone was really engaged and enjoyed the task. After this, we again went in to the woodlands- this time to look for sticks so that the children could make a mini raft with the help of the adults. After trying these out on the tarn it was clear that some builds had been much more successful than others- however some of them had worked brilliantly much to the happiness of the children, who were having great time down cooling off a bit by paddling in the lake. After this it was time to say goodbye to this group, and it was great to wave them off with smiles on their faces- they had obviously had a fantastic day out! Today was another day at Malham Tarn. This time we were expecting a group of Asian women and children coming from Bradford. Again we went up to the Tarn to set up the Bug adventure activity and the drove back down to Malham Car Park to meet the group. We set out the boots and coats that we had collected from the centre the day before and when the group arrived, some were kitted out in a colourful assortment of outdoor wear due to the unexpected chilly wind. We then set off back to the Tarn to retrace our steps of the day before around the boardwalk. Again some of the children were able to spot some animals and flowers and Judy explained about some of the unique flowers that we were seeing on our walk. On this walk, I was able to learn about the organisation that had helped to organise this outing for the group. It was really interesting for me to hear about what they did and what they were striving to achieve, and so lovely to be part of the group’s day out. Again we walked together up to a spot near the lake to eat lunch. It was a good opportunity to speak together, learn more about each other’s lives- the group was made up by a great mix of people, lots of them refugees or asylum seekers- and even to share some delicious food with each other. After lunch we walked all the way up to the Field Centre and our activity was to make necklaces for the children. Judy demonstrated how to do this so we split off in to pairs and we made some lovely necklaces! Then the children were able to create some beautiful bookmarks by picking some small flowers and sticking these to a piece of card. It was great to see their creativity and the pretty works of art at the end. We then walked over to the wood to do the Bug hunt again with this group; the children did really well at spotting lots of the animals! Once we had walked through the woodland a couple of times to spot as many of the bugs as possible, we made our way back to the field to play with the parachute- a favourite with lots of the children. This meant that the day ended with lots of laughing and giggling, a good chance for the children to run around and have lots of fun before their journey back. After a snack, it was time to say goodbye to the group. They had been such a lovely, bubbly group of people and this meant that we had all had a great, fun day together. All I knew about it, was that it was Woodland Open Day for YDMT. I wasn’t quite sure what to expect from this day, but was excited to see more of the work that YDMT does. In the morning I arrived at the Millennium Trust and got a lift with some people from YDMT, one was a trustee who had been with the organisation since its beginning and been going to these Woodland Open Days for nearly twenty years! We arrived at the site and I could see a large expanse of the landscape had been planted with trees. I found out that over 20 000 trees had been planted here and that lots of the people visiting had dedicated trees to others, or had them dedicated to themselves. It was surprisingly cold and windy in this spot, and so putting up the gazebo proved quite a difficult task! But soon, the gazebo was looking lovely with lots of YDMT merchandise making it very colourful. It was very chilly, so once some jobs had been allocated, some of us decided to go and explore the site and see the extent of the woodland. It was a beautiful spot and great to imagine how amazing it will be when the trees planted have grown. The day was quiet, possibly due to the dull weather, but it was interesting to meet some of the people who had dedicated/been dedicated trees and hear their stories about why they had. One couple had trees dedicated to them for presents and had driven up specially to see this sight; another lady had been dedicated a tree by Betty’s for her retirement. Despite the cold and wind, it was an enjoyable day, good to see the brilliant work that YDMT do and meet some of the people who really appreciate this work. Overall, I had a fantastic week at YDMT. I loved how varied it was and that I was able to be outside for the majority of the week (a lovely difference from being inside at school all day). Meeting new people and learning about their lives was my favourite aspect of the week, it was great experience and made it clear to me that the work they do is fantastic and that I would love to do work similar to some of their projects- projects that I can see have a really positive impact on people’s lives. Even on the days when I wasn’t working on The People and The Dales project, it was great to see what YDMT workers get up to and lots of the exciting projects that they are part of.